Like many people we were influenced by John Seymour’s classic self sufficiency book and Tom & Barbara in the Good Life. However this is practical help for those of us in the city or suburb as well as the countryside. We did learn to live frugally and although much of what we learned is common sense, a lot of it isn’t obvious. Recently there has been a resurgence in the desire to be self sufficient, take control and live a greener life. 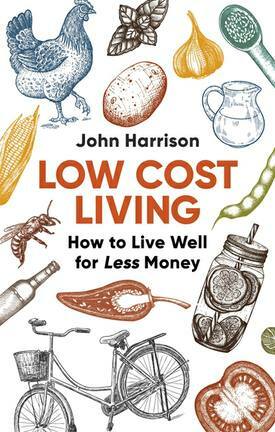 Now in its second revised and updated edition, Low Cost Living will help you to enjoy a better standard of living while saving money and helping the environment. Initially we wanted to call this book Self Sufficiency in the Suburbs but that implies it’s of no value to city or country dwellers. Eventually we kept it simple and that’s why it’s just called Low Cost Living. When things are tough, we all need to save money and this book will help. Our simple, tried and tested methods will help you to enjoy a better standard of living while saving money and helping the environment. Discover the benefits of growing your own fruit and vegetables, raising chickens, making butter, cheese and bread, and brewing your own beer. Save energy, save on your bills. Harvest food for free and avoid waste. Play the supermarkets at their own game and get the best deals. See how to recycle, re-use, make do and mend. Find out if solar power is right for you and whether wind power makes domestic sense. Most of all – live better, spend less and discover green doesn’t mean miserable! I love the way this book shows how a less consumerist, more ecological lifestyle can also be more economical. I am also impressed by how it is helpful to those who are new to the concept as well as to those (like me) who are already converted. It’s very well organised and also indexed, so can be read cover to cover and just dipped into when you want information about something specific, and the basic guidance is nicely laced with interesting facts and background information. I am sure that anyone buying it will save the (minimal) cost of the book many times over by following the advice within it! Even for those of us who recycle, shun supermarkets, cut waste and cook – there are fresh tips to be found in this little book which can be read cover to cover in one short sitting. We grow what we can and have cut down food and packaging waste by only buying what we need so we thought we were doing ok. But this little book flagged up the fact that we really don’t need to run the dishwasher for two hours on eco – 30mins does the job fine and slashes the energy cost; we always check and switch off our standbys but we’d overlooked the ‘phones on charge all the time and the ‘sleeping’ computer; we’d forgotten how delicious bread and butter pud can be – considering it’s made largely of stale bread and above all – we’d forgotten how rewarding life is when waste is cut, achievement is a daily event with home grown veg, home made jams and chutney etc and the freezer is full – all without the grind (and fuel cost) of the supermarket and the groan of the bills. It’s not about austerity or frugality – it’s about living a good life. If I have one complaint it’s about some of the comments regarding water saving – that it’s not all that important in a country as wet as the UK. Well even here in Wales with our rainfall we had drought orders this year – and let’s face it water, like everything else is a precious resource – we should be using it wisely. It’s easy to put this book aside and say ‘well I knew that before I bought the book, it’s just common sense’ – but the key thing is not just knowing, it’s doing. And don’t say you haven’t got the time – we both work full time, long hours – and this is a darn site more rewarding and relaxing than reality TV! This book is definitely a keeper and I suspect I’ll keep going back to it over the coming months and years. Not only is this book useful it was an enjoyable read. Informative, amusing and not condescending I recommend to anyone who wishes to cut back on bills or wants to live a more sustainable lifestyle. I love this book. And yes, a lot of it I already know and do but I just couldn’t put it down. It inspired me to look at what I really do and what I could put more effort into. I am already changing bad habits . . . . . and I had thought I was pretty good on the old eco warrior, money saving side of things.